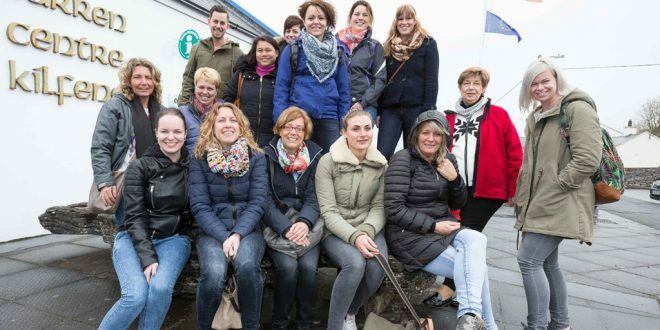 Dutch travel agents at the Burren Centre in Kilfenora, including (front, l-r) Cindy Van de Wiel, Tessa Harmsen, Renee Hawermans, Sofie Van de Kerchf and Josephine Bibo; (back, l-r) Jacqueline Van Howen, Miranda Koqman, Martyn Van Lienen, Laura Geux, Meta Buchnner, Marye Peters, Femie Hazewinkel, Mayola Gitmans, with Diny Kouwijzer and Linda Veeke, both de Jong Intra Vakanties. One of the biggest tour operators in the Netherlands, de Jong Intra Vakanties, together with 16 of its top-producing travel agents, were in Ireland this week as guests of Tourism Ireland and Fáilte Ireland. The aim of the travel agents’ fact-finding visit is to allow them experience some of the country’s superb tourism offering, so that when they return home they will be even more enthusiastic, and better equipped, to advise their clients about travelling here. In Clare, the group enjoyed visits to the Burren Centre in Kilfenora, the Ailwee Caves and the Cliffs of Moher. Karen van der Horst, Tourism Ireland’s manager the Netherlands, said, “Fact-finding visits like this are an important element of our work with the travel trade in the Netherlands, as the travel agents get to experience at first-hand what’s on offer here for Dutch holidaymakers.